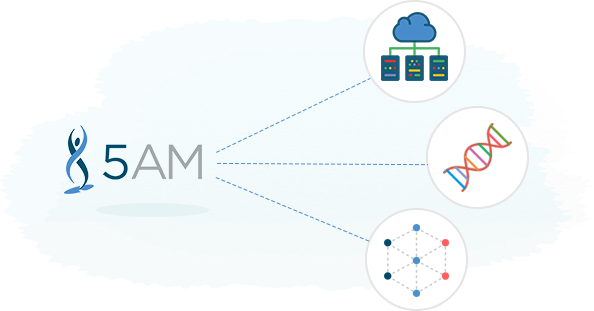 5AM Solutions provide cloud-based data solutions that enable healthcare organizations to design, aggregate, analyze and visualize genomic, clinical and observational data. Customers can use their platform to integrate data from multiple information systems and external sources to accelerate the discovery of drugs and treatments and improve the organization and management of complex genomic sequencing data. 5AM Solutions was experiencing rapid growth across all areas of its organization, which meant that it would take a long time to finish testing at the end of the development sprint. The company also wanted to create a separate environment for each of their branches to ensure maximum quality. Furthermore, their security requirements made it necessary for us to follow all the strict guidelines to protect their clients’ private data. We leveraged AWS CloudFormation to automate 5AM Solutions’ infrastructure and deployed containerized microservices with AWS. We then built a secure environment with AWS ECS and used Jenkins for continuous development and deployment. Each task was completed using best practices and procedures, and partnerships with nClouds’ partners and advisors. Throughout the entire project, we regularly updated 5AM Solutions’ team with information about the development process and timeline. We built Jenkins on AWS ECS using Groovy script to create images with Git SHA and push settings to AWS ECS. We then used ACS Deploy to push changes, and configured AWS CloudFormation to build new environments with each pull request. Jenkin slaves were scaled automatically based on the pull request. 5AM Solutions now has a secure environment that can be cloned to create different iterations and ephemeral variations. The company’s feedback loop was drastically improved to enable rapid experimentation and testing.